If you're looking for the ultimate upgrade to your old hairdryer, Dyson has you covered – the latest version of its Supersonic hairdryer is finished in 23.75 karat gold. 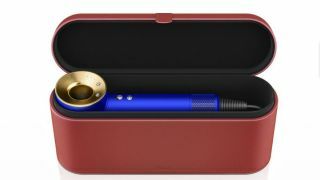 The Dyson Supersonic 23.75 Karat Gold is finished with gold leaf, which Dyson says has been ‘applied by hand using traditional gilding techniques’. Under its bling exterior though it's the same as the regular Supersonic, which comes in a range of colors. The company warns that the gold leaf is delicate and that, over time, the red base of the hair dryer may begin to appear – but apparently this is intentional, and not a defect – instead it's ‘something that makes each hair dryer unique to its owner’. Fortunately, the product comes with a red Gesso presentation case to help preserve the finish. You can watch a video showing the delicate manufacturing process on Dyson’s website. So how much will a gold-plated hair dryer set you back? In the US it's priced at $500 – that’s $100 more than the regular Supersonic. At the moment it's only available from Dyson’s US website – availability and pricing for the UK and Australia hasn't been confirmed, but you can expect to pay a similar premium over the £300 / AU$499 price of the regular Supersonic. If you're more interested in how the hairdryer performs than how it looks, check out our Dyson Supersonic review.